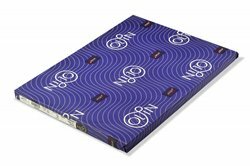 Olin Smooth Digital HP is a premium offset paper which accurately reproduces the full richness of colour using Electronik HP Indigo technology. This smooth version of Olin offers the softest finish in the market. Olin has been extensively tested to insure that its high quality credentials are maintained on all digital presses, to give you the first premium digital paper to achieve really flat tint areas as well as bold, vivid colours. Certified for HP Indigo, Olin Digital provides exceptional digital print results. Accurately reproduces the full richness of colour using Electronik HP Indigo technology.